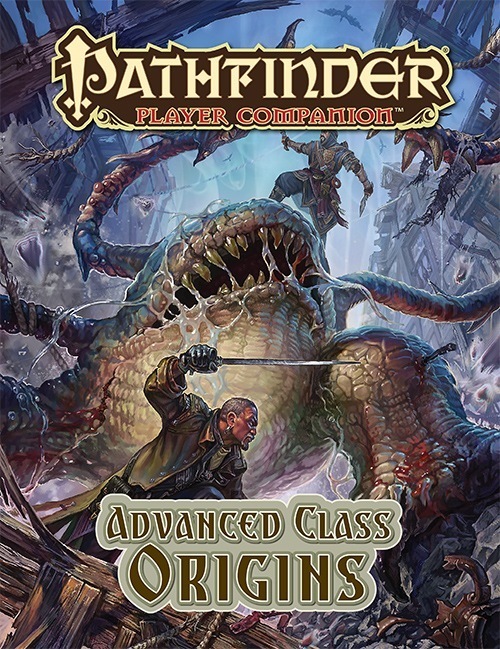 Unlock your character’s potential and become a master of the hybrid classes with Pathfinder Player Companion: Advanced Class Origins! Featuring never-before-seen rules options for the 10 new classes from the Pathfinder Roleplaying Game: Advanced Class Guide, this volume is the ultimate companion for bringing your hybrid class adventurer into the Pathfinder campaign setting. Whether your character is one of Geb’s enigmatic Twilight Sage arcanists, an investigator trained at Lepidstadt Academy in gothic Ustalav, or a scimitar-wielding swashbuckler dervish from Qadira, Advanced Class Origins makes sure her connection to Golarion is as powerful as her unique new skills and abilities. Written by Dennis Baker, Ross Byers, Tom Phillips, Stephen Radney-MacFarland, Owen Stephens. Cover Art by Igor Grechanyi. The bulk of Advanced Class Origins is made up of two page spreads for each of the ten new hybrid classes found in the Advanced Class Guide. Roughly one page is devoted to a discussion of common locations from where each hybrid class typically comes from, and the second page goes to mechanical options. The book then goes into new magic items, spells, and feats. The flavor information is pretty much what a fan of Golarion would expect. Arcanists are from high magic societies, such as Absalom, Nex, and Geb; while skalds are from the Lands of the Linnorn Kings. I personally would have preferred more details on the less obvious choices. For example, skalds are apparently popular in the Taldor’s army, which is strange for the “empire in decline” to encourage raging warriors, and I would have liked to learn more about. The meat of this book is the mechanical character options, which are to taste. For example, I like both the mechanics and flavor of the black blood bloodrager bloodline, and the seafaring dragon skald. However, some of the archetypes are for evil characters only, or are for very circumstantial builds. I do appreciate the callbacks to prior options, such as giving swashbucklers a whirling dervish archetype, and including scalykind and void blessings for warpriests. Each class spread has regional traits listed, some which are outrageously specific. For example, Lichblood can only be taken by characters from Belkzen with the undead bloodrager bloodline, and gives a +2 on Diplomacy and Intimidate checks only against orcs from Belkzen. The book includes feats, magic items, and spells, of which the feats especially should have been in the Advanced Class Guide itself. Not just the infamous Fencing Grace (Dexterity to damage with the rapier), but Expanded Spell Kenning (allowing skalds to access the druid and witch spell list) and Pack Tactics (treating animal companions has fellow possessors of a teamwork feat). 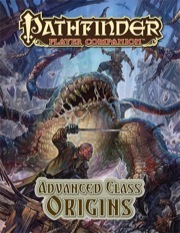 Advanced Class Origins is recommended for players interested in the hybrid classes found in the Advanced Class Guide who are looking for a few additional mechanical options. On the whole, there is quite a bit of useful material in Advanced Class Origins for people who use the hybrid classes from Advanced Class Guide. Even though there are a lot of classes to cover and not a lot of space in the book, it manages to provide a good variety of options for each of those classes. It also does a good job of adding a lot of Golarion-specific flavour to the classes, with archetypes and abilities that are tied to specific locations in the campaign setting. Overall, it's a pretty decent book. I feel that Paizo's staff really hit the mark with this book. I like Golarion and I want to anchor my character into the setting. Advanced Class Origins does an excellent job of providing that opportunity for the hybrid classes recently introduced to the campaign. The options aren't superior, but they are immersive. It does basically what the description says. Nothing more. Add in how disappointing the actual ACG was as a whole, this one basically does the minimum to fix or empower what is needed, but instead focuses on holding your hand to fit a great deal of the newer classes into the more obvious flavor themes of the setting. But in a lot of ways it fails to actually bridge the gaps even on that front. It was pretty clear in the ACG that the writers loved some classes and well, had to do something for the others. Thats basically repeated here, where some classes get cool stuff and others get a whatever scraps are left just so they have a new option in the book. Lack of Favored Class material for the common non-core races is a huge let down. There is a section about Prestige Classes, but is kind of worthless as it basically traslates to ask your DM, (well, duh). There is just nowhere near enough in this book. What is there is writen well and enjoyable, but tends to be not terribly useful in favor of being niche. It partially feels like some of the almost finished material that they just couldnt fit into the ACG but not enough for its own book, so they added some filling in the form of setting flavor. If you thought the ACG was perfect, you will probably like this one. If you wanted some fixes for that same book, its probably not for you. Its possible that when they get around to redoing the ACG that this book might get an indidect boost. Its probably not fair that the issues with the ACG directly affect this book as much as they do, but hopefully (if) when that changes, the reverse might be true as well. Advanced Class Guide Origins is more material for the new classes from the Advanced Class Guide, but with more Golarion fluff mixed in. I was sad to see that their expansion of the Slayer didn't include more talents, and there wasn't a lot here I cared about. Their Osirion themed Hunter archetype traded away the base Focuses for desert focuses, but unless you're trying to build something really specific these seem almost universally weaker. While there was some cool stuff sprinkled throughout and they provided some guidance on where everything fits in the Golarion world, nothing here really excited me. Calling an Aldori Swordlord archetype for Swashbucklers now. A Shieldmaiden Warpriest, able to enhance her shield rather than her armor. Shield bonus feats and reduced blessings/spellcasting. A Witchdoctor Shaman, with better access to necromancy divine spells and command over undead/negative channeling. A Flying Duelist Shwashbuckler, expert in mid-air fencing duels. A savant arcanist able to gain more school/bloodline powers. An option for CG/LG Hunters. Nice- especially since, as a Player Companion- this is bound to be more specifically Golarion focused. Owen Stephens ... this name sounds familiar. He might be kind of a big deal. Or something. I suppose a rondelero duelist archetype for the swashbuckler is too much to ask for? Neat concept. With all these new classes coming out, a Golarion book like this to anchor them to the setting and talk about how they fit in is probably a sound idea...and new archetypes, feats, traits, and spells that are unique to their Golarion editions to really make them feel like an integrated part of the setting, instead of just kind of tacked on. Be interesting to see the results! A ShieldmaidenCpt America Warpriest, able to enhance her their shield rather than her in addition to their armor. Shield bonus feats and reduced blessings/spellcasting. I would really, really love it if the term "witch doctor" were restored to its original meaning: not some kind of stereotypical "primitive tribal" witch, but someone who specializes in countering evil magic and curses. A doctor who undoes the work of evil witches. ...now I'm thinking an alchemist archetype. One of the Cleeic Archtypes in Undead Hunters might be what you want. feels kind of soon since we haven't even seen what options they get in the hardcover book they appear in. Well, Advanced Class Guide is coming out in August, right? So there's at least two months between the two if you want to see what's there to decide to preorder it...and plenty longer if you're fine with buying one or both after they're already out. How about an Arcanist archetype, building off their dispel at a touch abilities? Add some Break Enchantment and you are good to go. Please, a mounted Swashbuckler, sir? A swashbuckler who focuses on natural attacks would be cool. I feel like a lot of the hopes people have been expressing here are generic enough that they could be in the hardcover book. Yes a lot of those ideas could be, but that doesn't mean they will be in the hardcover book. Also this book has longer for release wich means more time for some these ideas to be included. I asked for that but misspelled the name. Pretty sure the Iron Mount guys in Numeria have always been called Arcanists as well, even back before the Inner Sea World Guide. I feel like 32 pages is lacking to cover new material for 10 new classes. Why wasn't this given an exception and pumped to 64 pages? Because then it wouldn't be a Player Companion. It would jump the price for one issue of a line that has had a steady reliable price for most of its existence. Maybe they could have done it in 2 installments, but they did not. We have the 32 page book, which I have no doubt will be good. I just hope it's filled to the brim with crunch and very little fluff. is most relevant. As we did with the Advanced Player's Guide, additional content for these classes will be added as appropriate where it makes the most sense in our campaign setting. I for one would love to see how the team manages to fit bloodragers into the campaign setting. In my opinion, they're the most exotic of the new classes. Then a 2 parter it should be. I really am trying to figure out, outside of the fluff content going in, how much crunch each class will really get in this? Ideally, my hope is 4 feats per class, 4 spells per class, 2 archetypes per class, 3 magic items per class. Which would amount to 40 feats, 30 magic items, and 20 archetypes and I dunno how many spells, I know a few of them have their own spell list...of which I highly doubt could ever fit in 32 pages unless you took all the fluff out. With those expectations in mind I think you should be prepared for disappointment. This book will likely focus of the Flavor of where these classes (best) fit into the world of Golarion. There will no doubt be Crunch options that help illustrate how these classes fit into Golarion, but by no means will those be an exhaustive list of every place and option appropriate for these classes in Golarion. That has never been the way Paizo does things. Note I am not being mean here, just pointing out what I think we can expect. But it's a Player Companion, a book solely meant for providing players with more options for the Pathfinder material newly introduced in the game. What you speak of sounds more like the Campaign line which is more for the GMs. Point 1: Flavor is for PCs too. Point 2: What I describe is what we generally have gotten with the Companion line. I wish we'd had this for the APG. I still don't feel as comfortable dropping those six into a campaign as I do the older classes (especially the Summoner, whose mechanics, while well done, clash with a decade or more of established outsider lore). I look forward to the crunch, but for once I may actually be more interested in the fluff. I thought about this too, but then I remembered James Jacob's saying that, with the exception of the Summoner, all the APG classes have been kicking around in Golarion from I believe the beginning, or not much longer after. Least, I'm pretty sure that's what I recall. Yes, for what I recall, they have been hinted at since the 3.5 days. While I am looking forward to this book I am kinda of disappointed. I was hoping for a Blood of Hags or Blood of Witches (IE a book for Changelings) this Oct. This will be helpful for the flavor, maybe even changing the class of some NPCs to better fit their concept. However, to the "casual" observer, there is little obvious difference between a Fighter, Swashbuckler or Brawler, except their choise of weapons or armor. Even a Cavalier just looks like a Fighter with a nice horse. Same goes for Clerics and Warpriests or Wizard/Sorcerer/Arcanist. These two things are what I want most out of this book. I want a slayer archetype for the red mantis assassin. A 4th level human playtest swashbuckler could qualify for (and use effectively) the Taldan Duelist feat as written. I know, but I would still like an archetype. There is a fighter archetype for both of these fighting styles, so I figure there is design space to give the Swashbuckler (and maybe even the Slayer) these archetypes as well. Though as zergtitan said, Slayer should get a Red Mantis Assassin archetype for maximum cool. They have to take exotic weapon prof with the sword, then take a feat to allow it to work with precise strikes. An archetype would probably reduce the feat burden at the cost of restricting class features to Dueling Sword only. Definitely getting this for flavor alone. My exact words when I saw this: "Wow, this is the best idea for a book ever. I wonder if it'll be a GenCon... nope, October. Drat." Now "best idea" is certainly an exaggeration, but this sounds awesome.